Larry Mills introduced Mark starting with a quote from Mark, "Rotary is the oldest and largest service clubs in the world but Rotary is more than service." Rotary offers a variety of ways to connect with others on local and international levels through vocational exchanges, Rotary Action Groups and Rotary Fellowships. Mark has been a Rotarian for 30 years. He is a Past President of the Rotary Club of Santa Rosa, CA and the founder of Rotary Means Business Fellowship. Mark and his wife have been married for 38 years and do not have children but act as unpaid staff for their cat Long Tall Sally. Also stayed in hillside mansion in Malibu, a cat house overlooking the Gold Coast of Chicago and a canal side apartment in Amsterdam. He paid $0.00 for all of those accommodations. It was possible because several years ago he joined the Rotary Home Exchange Fellowship. He has been trading his house for places to stay since the late 1990s. He has enjoyed almost 30 home exchanges in that period. He asked how many people have heard of the Rotary Home Exchange Fellowship? Very few hands were raised. He asked how many people have heard of License Plate Collectors Fellowship, Doll Lovers Fellowship, and one of his favorite new one is Beer's Rotarians Enjoy Worldwide (BREW) . All of these are a part of an organizations that encourage Rotarians with common interest and common vocations to get together outside the usual lunch meetings and fundraisers. Fellowships are a group of Rotarians, including spouses, that have a common interest. The goals are social, not service. 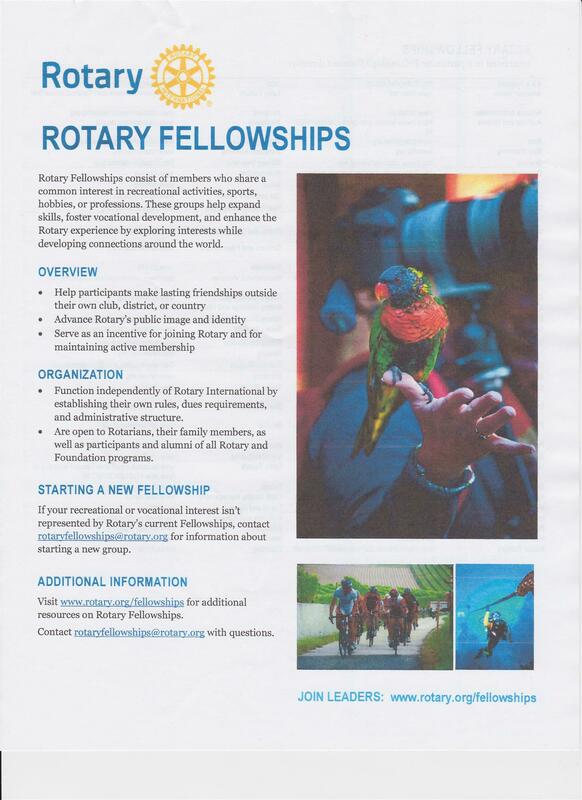 There are 77 Fellowships approved by Rotary International;. some of which are Antique Automobiles, Skiing, Yachting (The oldest fellowship at 60 years old. ), Photographers, License Plate Collectors, Flying Airplanes, Scuba Diving, Cycling, Caravanning (known here as Recreation Vehicles), Railway. Wine Appreciation, and Rotary Means Business. For a complete list see last two pages of this summary. The benefits of Fellowships offer opportunities to build lasting friendships outside club activities. Fellowship are Rotary wide. Fellowships can be a great way to recruit and retain members. One who tires of the regular lunch meeting might be more willing to be a member if they have a strong interest in one of the Fellowships. He talked about a sheet on each table explaining Fellowships with a listing on one side of all the approved Fellowships with contact information. Most districts have a Fellowship chairperson who can help Rotarians connect with Fellowships of interest. He asked how many have a Profile on Rotary.org. He suggested that each of us go to Rotary.org and create our profile. This is helpful to someone who is forming a Fellowship connect with people who might want to participate. that one day on the cruise most Cruise Lines host a Service Club. Rotarians, Kiwanis, Lions, and other service club members will be in attendance. It is a good opportunity to meet people who are involved in other Service Clubs and most clubs will accept it as a make-up. it International. 2009 it started in Santa Rosa. 2013 it became an official approved Fellowship. There are now over 50 chapters. Two areas that are growing rapidly are USA and primarily Florida. They expect every district in Florida will have a Rotary Means Business Fellowship group. India is also growing rapidly. What happens at a RMB meeting. Often meetings are held at a place of business. He showed a picture of a meeting at Mike Pasterick's (past president of Rohnert Park Club) a Door Shop on Gravenstein Highway. People love to see how things are made. He mentioned Steve Olsen who is very involved in Pacific Coast Air Museum. The main purpose is to get to know other Rotarians and about their business so you can do business with other Rotarians: network, talk, and may have an assignment to meet with someone you met there at another time. Since all are Rotarians and live by the 4 way test there should be a level of trust. They were recently contacted to find an expert witness for a case related to Real Estate Tax Law which they were successful in doing. Another person needed to find someone to repair an antique grandfather clock which they were also able to do. He hired a person referred to him by a RMB member to build his Bocce Court. Most Fellowships have a Facebook page telling about their activities. The Rotary Club of Sydney officially uses RMB as a recruiting tool. As part of their process a member has to take a new member to an RMB meeting. In one year they added 25 members. This is a club of about 200 so it was 12.5% growth. He feels that having RMB as a part of the Rotary experience helps keep a person a member of each Rotary Club.